Greetings again from the darkness. The war on drugs has become a bit of a punchline in the real world, but has proven to be fertile ground for filmmaking: Sicario (2015), American Hustle (2013), Traffic (2000). Additionally, the popular Netflix show “Narcos” takes on the same Medellin drug cartel as this latest from director Brad Furman (The Lincoln Lawyer, 2011). 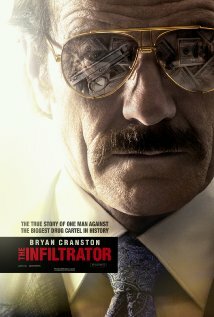 The movie is based on the true events of Robert Mazur’s book “The Infiltrator: My Secret Life Inside the Dirty Banks Behind Pablo Escobar’s Medellin Cartel” (a title that’s very descriptive, if a bit long). Bryan Cranston continues his impressive Hollywood run this time as Robert Mazur, the man who goes undercover to expose the money-laundering system of the cartel. His flamboyant alter-ego is known as Bob Musella, a character that allows Mazur (and Cranston) to show a side not typically seen. His antics get him inside Columbian Drug Lord Escobar’s organization in the mid-1980’s. When Mazur realizes the traditional method of chasing the drugs isn’t working, he decides the age-old idiom “follow the money” might be a better approach. This takes him inside the world of international money laundering, and he learns that banks and governments are quite dependent on this huge business of drug money movement. There are specific groups of people here: the government agencies, the small task force, the corrupt (and appreciative) bankers, the various levels within the cartel, and even Mazur’s family … all these forces intertwine to make life difficult for Mazur and his team, and provide a glimpse into the complexities of undercover work. In addition to stellar work from Cranston, the cast is terrific. John Leguizamo plays Mazur’s motivated partner Abreu; Diane Kruger plays his undercover fiancé; Juliet Aubrey is Mazur’s real life wife who doesn’t much appreciate his declining the early retirement offer; Olympia Dukakis provides a dash of comedy relief as Mazur’s Aunt; Yul Vasquez is the creepy money manager for Escobar; Benjamin Bratt plays Roberto, Escobar’s right-hand man and the key to Mazur’s case; and Elena Anaya (The Skin I Live In, 2011) is Roberto’s wife. Also present are Amy Ryan, Jason Isaacs and the always great Michael Pare. There are a couple of standout scenes – one involving chicken and voodoo, and another with a briefcase mishap, but my favorite is the Happy Anniversary cake scene in the restaurant where Mazur flashes his alter-ego Musella for his real wife to see … and she is understandably stunned. The movie does a nice job of capturing the look and feel of the era (30 years ago), but it’s somehow missing the elevated suspense it portends to drag us and the characters through. Some elements seemed impossible to believe – why would Mazur risk his family’s safety? The timeline was a bit muddled. We aren’t sure how much time has passed, but there certainly don’t seem to be enough interactions before Roberto is telling Mazur he is “like family”. It plays a bit like those romance movies where the two leads are head over heels in love after a conversation or two. An element is missing and it affects the level of tension throughout the film. And that’s something even a Leonard Cohen song (“Everybody Knows”) can’t fix. Greetings again from the darkness. Remember that time you bashed your lover in the head with a lamp, left them bleeding on the floor, and then drove around for 3 days before turning yourself in to the police, confessing to what you assumed was a murder? And then remember how emotionally free you felt when it was discovered that not only was he/she alive, but they didn’t even blame you for the head injuries? Well that’s exactly what Diane Kruger’s character, Romy, goes through during the first part of the film. Romy and her husband Richard (Gilles Lellouche) have travelled to the southwestern United States from their home in Paris. It’s pretty clear that their hope is that this vacation will reignite the passion they once had and break them out of their marital slump. A few too many drinks at the bar leads to some unwanted amorous advances, and in the heat of the moment, Romy starts whacking Richard in the head with the lamp. Once she realizes that he survived and she’s not going to spend her life in prison for murder, she also decides that she’s not going to spend the rest of her life in a dead end marriage – a different kind of prison. Instead, she sets off on a journey of self-discovery. She even mentions how free she is, and can choose her own path. 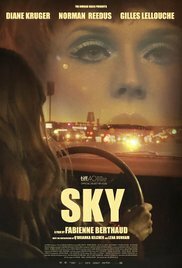 Her self-discover phase takes her to Las Vegas – courtesy of a truck driver played by Lou Diamond Phillips. Within a short period of time, she has befriended a lady (Laurene Landon) who wears a bunny suit in order to pose for pics with tourists. Romy borrows the bunny suit and meets a mysterious cowboy (Norman Reedus) named Diego. It’s the relationship between Romy and Diego that dominates the final 2/3 of the film, and though they both create interesting characters, it’s a bit of a letdown after the story’s set up with the French husband. Lena Dunham has an odd turn as Diego’s sister-in-law, and there is a dose of spirituality from Native Americans, but mostly this is Diane Kruger’s movie. She seems to be enjoying the wide range of emotions while showing off her talents, and she keeps us interested enough to keep watching … even when the pace slows to a crawl.